Fitness doesn’t have to be a solitary task. In fact, it can be more effective when you partner up and work out with friends. Here are some benefits to working out with other people. Getting to the gym is sometimes the hardest step. Knowing that someone will be there to meet you is a big motivator. And it’s backed by science! A study found that exercising with a partner is key to working out more often. Plus, you have to schedule it in advance to meet another person (or people), so it will be on your calendar. Group Fitness classes can be the perfect place to meet. With our 60+ scheduled classes a week to choose from, you can add variety and socialization to your workout to keep you on your toes. Check out your local Healthtrax location for more information. Do you consider yourself a competitive person? Whether you do or not, working out in a group setting can bring out your ambitious nature. A study from Michigan State University tested three scenarios: one group worked out alone, the second with a partner and the third with a “virtual partner”, people exercising on video, but seemingly outrunning their real-life counterpart. During each exercise, the virtual partner group outlasted the real partner group by an average of two minutes, and the partner less group by 10. That means that if you really want to step up your fitness game, it's worth recruiting someone who'll keep you on your toes—even if you're just sharing stats over text. Our Trax Trainers can be that “virtual” partner if you need someone to push you more. A winning combination is having both you and a friend work with a trainer to set goals and have another person to cheer you on. 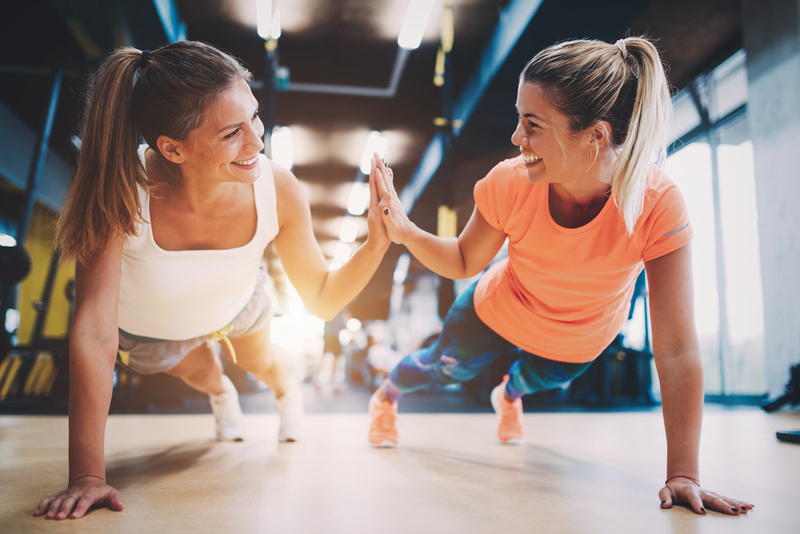 Another study focused on the impact of group exercise, especially working out in sync, on social bonding, pain tolerance, and athletic performance. Participants were tasked to row on the rowing machine, either solo or in groups. Those who had rowed in groups, and synchronized their movements, were shown to have a higher pain tolerance compared to solo rowers. This post-workout feeling increased whether people were rowing with teammates or with strangers. Group fitness classes like Group Groove and Zumba are great for getting in sync with your fellow participants, and our MOSSA classes change every 3 months, so you won’t get bored. Also, at Healthtrax, the small group training sessions can be another opportunity to get in sync with a smaller, more dedicated faction. Most importantly, working out with other people makes it more FUN! Even if you can’t be in the same place at the same time, fitness apps and trackers make it easy to connect with your friends and family wherever you are. Stop by the front desk of any Healthtrax locations to get started!